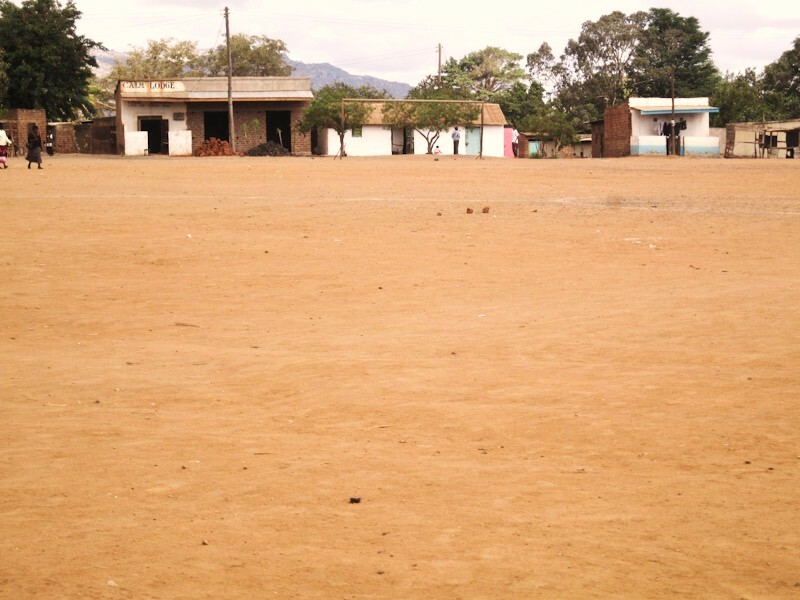 One of the goals the Johnsons had for us before we arrived was to return to the areas where they had held the Bible school and hold conferences. On October 21st and 22nd, Kathy Johnson and I held a women’s conference and Don taught the book of Daniel to the pastors and church leaders. Kathy and I had about 25 ladies and small children on Thursday. On Friday we invited the ladies from the churches of the graduates and over 80 came! Our goal was to encourage them in their personal walk with Christ, share ideas of how they might enrich their ministry to their families and the women in their church, and we also wanted them to have fun. On Friday morning we began with the Toilet Paper Game! We handed out rolls of toilet paper and told them “Take all you think you will need.” We got some strange looks, but since most of these ladies have very little some of them took advantage of the opportunity and stocked up! After all had taken “all they needed” we announced that each lady would share with the group something about themselves for each square they took! The smiles on their faces were priceless. After all had shared, Kathy pointed out that it did not take much money to have a good time and learn more about each other. 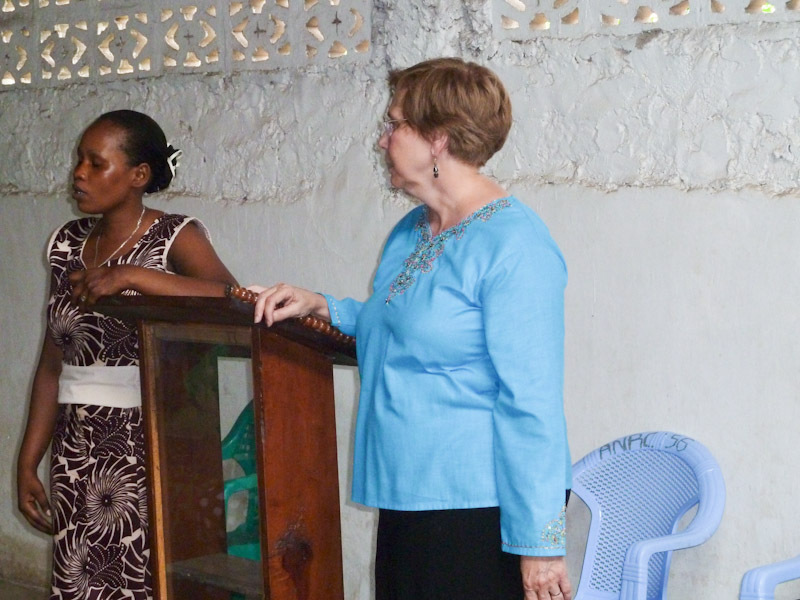 We ended each day in personal prayer with the ladies; having them pray for each other in groups of two. It was a great time of ministry. 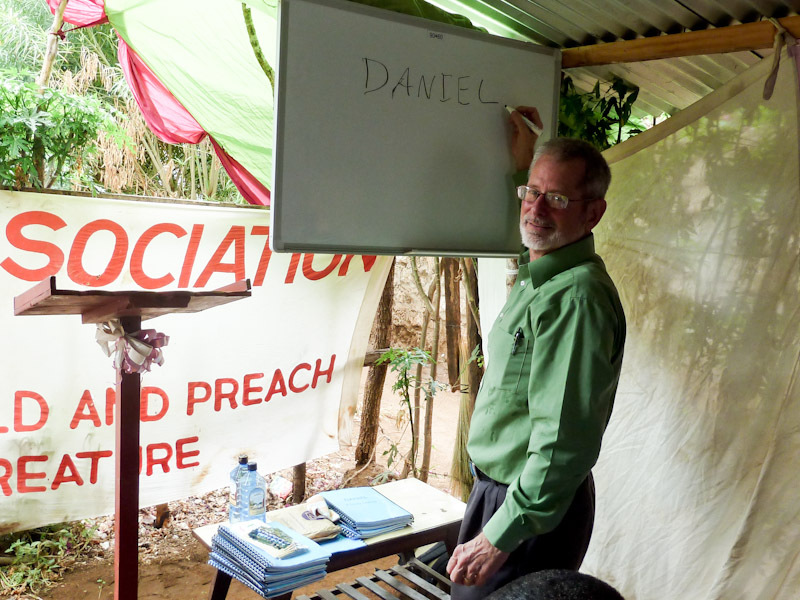 Don had a powerful time as he taught the men for ten hours in two days on the book of Daniel. The men all reported that they learned a lot. The Word of God was their textbook and they had discussions on prophecy. He had some “problems” with his white board. After we returned home we discovered the problem was he had been writing on the protective film, not the white board! Once we removed that, it is now ready for the next time! No more using kerosene to clean the board! 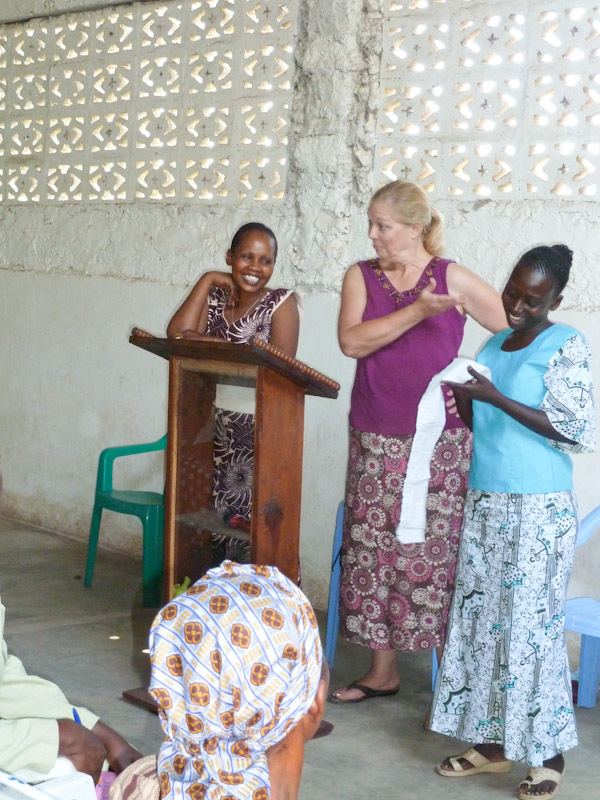 We were privileged to pray for Bishop Joseph Manzi’s wife, Angnes, on Thursday afternoon. She had become ill after graduation and had been diagnosed with “a fatty liver”. The church and friends had been praying for her. When we arrived at her home she was very weak and her abdomen was swollen. Kathy, Don and I prayed for her and anointed her with oil. We left fresh drinking water for her and told her daughter to watch her through the night. We were very concerned for her life. At 7:30 the next morning Bishop Manzi called to tell us she was healed and she would be in our meeting that day! Oh, how we rejoiced for her healing. It was truly God working. Angnes came to the meetings all day Friday and showed no signs of any illness. When we saw her on Sunday she was much stronger and so happy! Don preached in two churches on Sunday in Malindi. The second church was Pastor Douglas Mwadziwe’s church located in a very poor area. At the end of the service Pastor Douglas invited Don and I to join him in praying for those who wanted prayer. Several people came forward and we prayed for them. One young mother requested prayer because she could not pray; every time she tried “something” stopped her. When Don placed his hands on her shoulders and began to pray she screamed and fell backwards. Pastor Douglas prayed with her as the evil spirit left her. As tears streamed down her face she began to pray and praise God! God’s timing is perfect. This lady had never been in that church before! We asked Pastor Douglas and his wife Elizabeth to follow up with her to be sure she continues to come and be discipled. As we left Malindi we were grateful to God for all He had done in our life and the lives of those we met. To see God work miracles of healing and deliverance was a huge encouragement to us. It wasn’t by our might or our power, but by His Spirit that lives were changed in Malindi! Thank you for helping us touch the people of Malindi! We appreciate all your prayers and encouragement as we continue our assignment here in Kenya! We are excited to see what comes next!!! Don sent out an appeal email to a handful of his friends right after we arrived here in September. God led a college buddy of his who he hasn't seen in over 20 years to share the request with his Sunday School class in Houston. In less than a week the entire project was funded! God moved on the hearts of those class members, who have never met us and a member of our home church in Rockwall. Only God can do that type of fundraiser! 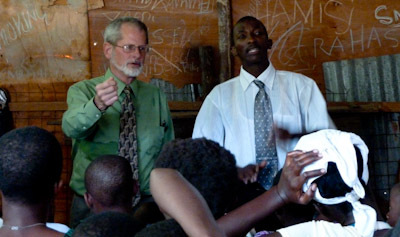 It is humbling to be used to help Kenyan pastors reach the lost of their villages and then disciple them. 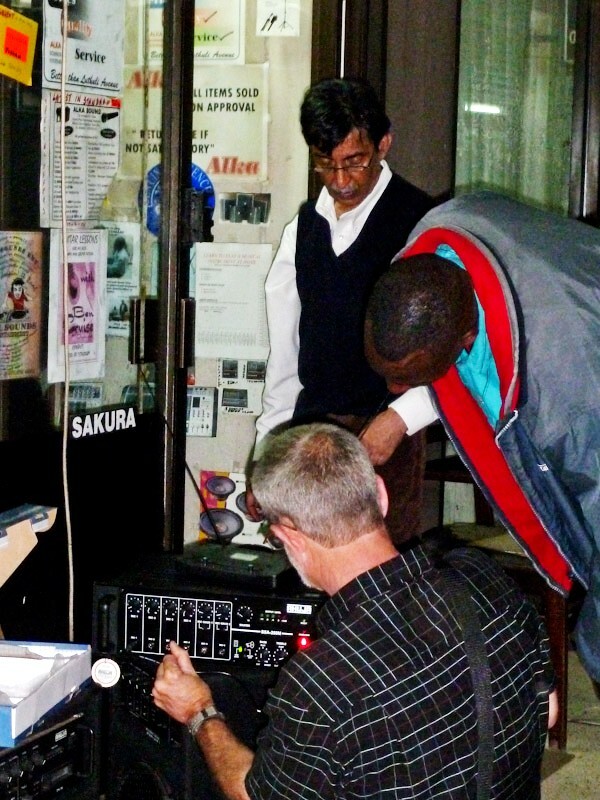 Biblical Life Ministries was given a state of the art projector last June. With the funds we received, we purchased the amplifier, 2 speakers with stands, 2 wireless microphones and all the connecting cords. While we were in Kibwezi this week meeting with the graduates from the first Bible School four years ago we arranged to show the Jesus Film NEXT Saturday and Sunday nights (November 6th and 7th)!! We will be in an open area in the village. Saturday morning we will hold a seminar for the church members who will assist with the follow up ministry for those who accept Christ. We have yet to purchase a generator so Pastor Shadrack Maunda is going to find one for us to use in Kibwezi. We are waiting to find the right generator for the right price. We ask you to pray for wisdom and favor. November 13 and 14 we are taking all the equipment with us to an orphanage near Kisumu on Lake Victoria. Our friend Rachel Howington from Texas works there and we will stay with her at the orphanage. We plan to show the film in the orphanage and hopefully in the surrounding village. Wow, from one short email appeal in September to four different showings by mid-November! God can work fast to get His Gospel out to those who need it! Thank you for your prayers and support! Saturday night Don was boiling a chicken to make chicken and pasta. It took longer than he thought, so it was after dark when it was ready to eat. A few minutes before it was done we heard a knock at our gate. The night guard had come to tell us we needed to close our chicken window. At first we thought he had smelled our chicken, but no, he said he had seen our chicken window open after we went to bed the night before and he feared bandits could break in if we left the chicken window open. This seemed strange to us because we hadn’t seen any chickens around our cottage. So we asked, “Which window is our chicken window?” The guard pointed to the window at the back of the house. We asked if we could leave the other windows open and he said that was fine. We told him we would be sure to close our chicken window before we went to bed. The guard left and we sat down to eat our chicken pasta. After a few bites it hit me! Our CHICKEN window was really our KITCHEN window!!! The guard must have thought “those poor white people are really dumb!” We almost fell out of our chairs because we were laughing so hard! From now on we promise we will close our chicken window before heading to bed. I sure hope the guard doesn't tell everyone about that crazy mzungu (white person) that doesn’t know what a chicken window is! Tomorrow we leave for five days in Malindi. Kathy Johnson and I will hold two days of Ladies Ministry and Don will teach "The Book of Daniel" both days to the pastors and church leaders. 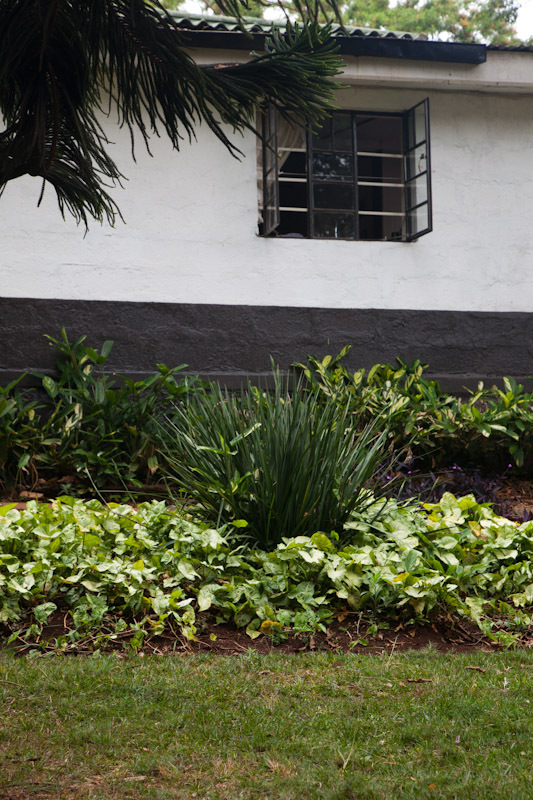 Kathy returns to Nairobi on Saturday to take care of her family. 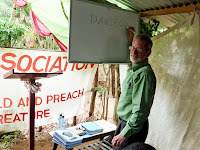 Don and I will remain to look for a possible location for the next Bible School in a Briefcase on Saturday and on Sunday Don will preach in a village church. 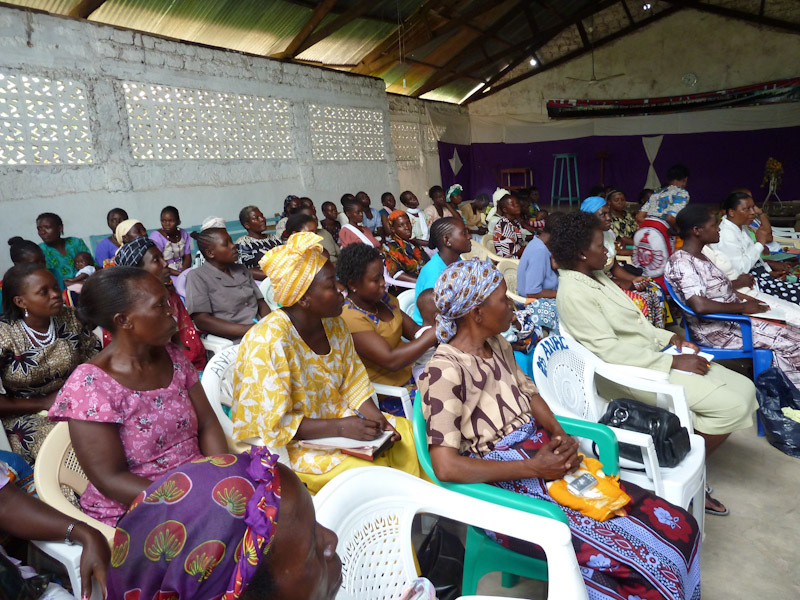 Next time I will share about our newest project using The Jesus Film in Swahili. We are amazed at all the Lord has given us to accomplish here in Kenya! It is exciting to know that HE is directing our path and He will receive ALL the Glory! We appreciate all your love, prayers and encouragement. We both think we are having way too much fun doing this missionary work! I do promise we are working! On Saturday (September 25th) we visited the area where we would be speaking the next day. The Pastor, BLM student Micah Gichor, established the church in that area 2 months ago. We walked through the village and greeted the people. The littlest babies were scared of me, they had not seen a white woman before. We prayed with Daniel for his wife who was in the hospital. Her name is Jumwa Boja. 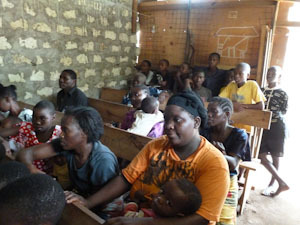 They are members of Micah’s church. 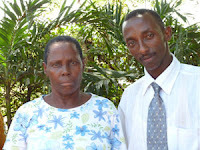 She was very weak and had not been able to speak, complications from diabetes. As we left, Micah asked if we would drop him at the hospital so he could pray for her. We asked if we could come along. So off to the hospital we go! It was open air, no windows or screens but clean. When we found Jumwa, Micah and I asked God to heal her and we left. The next day (Sunday) Don preached in the little church filled with many children. Two months ago they had never heard about Jesus! The children of the village are encouraged to come and sing and learn about Him. Don brought an outstanding message and ended by inviting anyone who wanted to accept Christ to come forward. A mother of one of those little children who had been coming and learning songs about Jesus came forward and committed herself to Christ! Her children had brought her the Good News and we were able to witness her new birth! 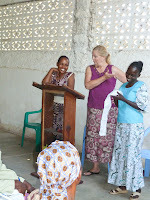 Pastor Micah will begin her disciple training very soon. During the service Don encouraged each member to rejoice with Daniel and Jumwa when she returned from the hospital. He told them to believe for her healing. After the service we found that God had raised her up. She would be released that day! The only problem was here they hold you in the hospital until you pay your bill. Your friends and family have to provide you with food. The patient has to remain until the debt is paid. The bill was for less than $30 but they had no way to pay. God had a way. God’s ways are higher than ours! He gave us a call so many months ago to come to Kenya. We had no idea what God had in store. We prayed for Jumwa, God healed her! We gave the Gospel message, a mother was born again! We brought funds from other believers, Jumwa was released from captivity! We stand in awe of God and how He works.